Having owned horses for over 20 years, I have come to appreciate a horse with good, solid ground manners. Groundwork is a great tool. It is something that can be worked on when it is raining, snowing or just plain too hot to ride. Young horses and old ones benefit from groundwork. The key is to start slow and work your way up to more complicated behaviors. Once you and your horse can do the basic maneuver, you can start to think of ways to mix things up and make them more challenging. Here are some ideas for you. These are my 10 of my favorite groundwork exercises from the list below. Yielding hindquarters, in its most basic state, is just your horse moving his hind end away from you with a physical cue on his side. Typically the fingertips are used to press his side just behind where a back cinch might sit on a western saddle. 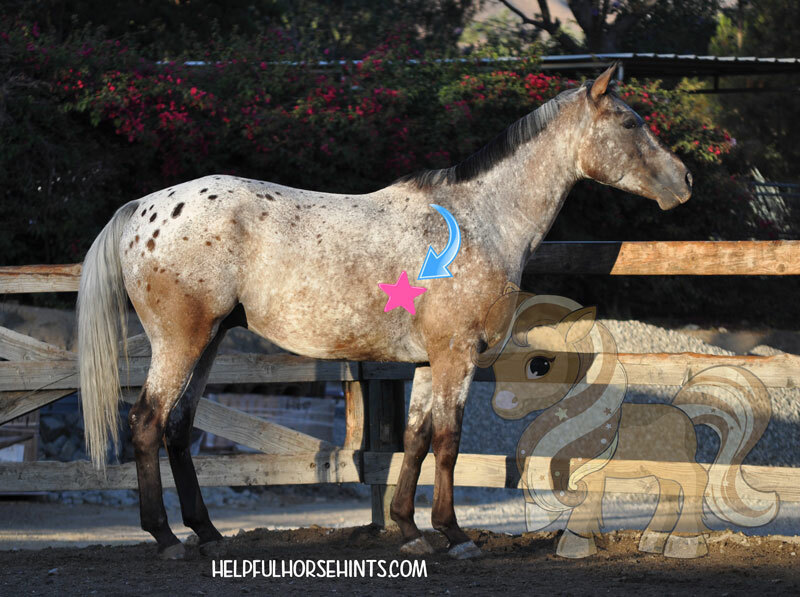 Kind of where the gold star is on this appaloosa gelding. 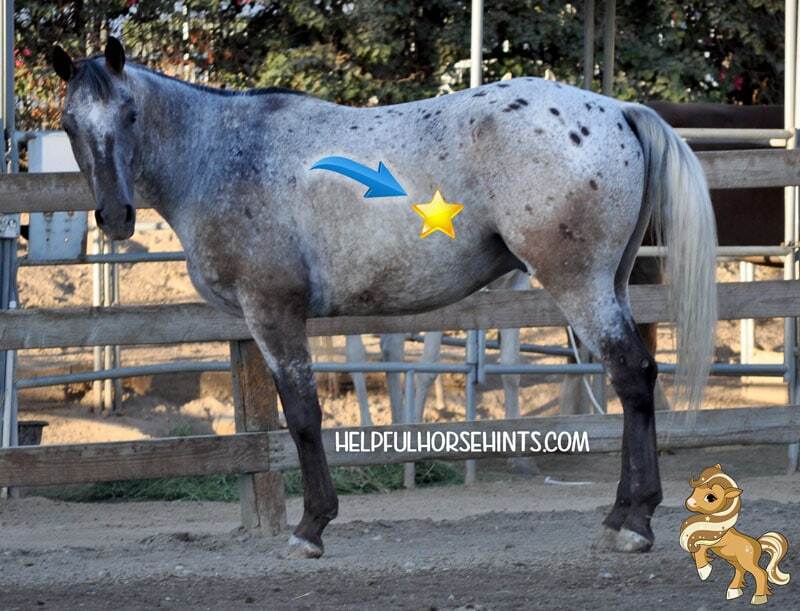 I usually ask my horse for a hindquarter yield by pressing on the area marked with a star. Once the horse can respond to light pressure on his side, I might mix it up. Will he respond with a suggestion by me just pointing at his side? Think of other ways you can disengage the hindquarter. Can you teach a verbal queue for it? I’ve taught horses the word “over”. Start simple and see where you go from there! So many equestrians lunge their horses around and around with the only real point being to let the horse work out any kinks and excess energy before being ridden. Some equestrians are against lunging all together. I’m not one. For me, lunging is a great tool that can be used to help a horse release some excess energy while also using his mind. Almost all of my personal horses have been taught what I call “lunging with respect”. They learn several verbal commands and learn to respond when asked to transition up to a trot or lope and then down from a lope to a trot, walk, or whoa. I’ve even taught a few to “change” direction. Think of lunging like a game of Simon says and see if you can keep your horse’s mind occupied. As you get better, see if you can work towards a walk to canter transition or a canter to a walk. 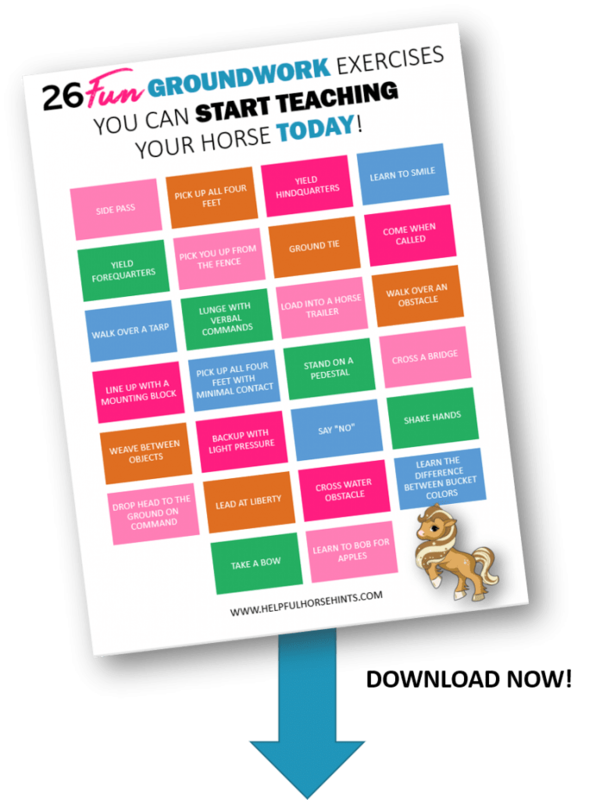 See how fast you can get a whoa from a trot or canter. Can you get a roll back by asking your horse to “change” direction when loping? Lunging can be super fun when you think outside the box! Once your horse is great on the line, try lunging at liberty! Lunging a horse at liberty. I’ve forgotten to teach this one a few times and then needed to trailer or get a horse out of a sticky situation and was reminded how important it is! A lot of horses have opposition to backing up. Groundwork can help your horse learn to be more responsive and in tune to your requests. Once they can backup with slight pressure on the nose (usually the easiest place to teach), see if you can teach them to back up from pressure on their chest. Then, what about on a verbal que? Can they back up at liberty? All kinds of fun things can be done with a simple behavior like backing up! I usually teach the backup using the nose first, and then the chest. We talked about yielding hindquarters above, yielding forequarters is another favorite. I typically start with asking just for one or two steps and then building that up to where my horse can do a full circle, very lightly, to either direction. This one is a little harder to come up with different ideas to make it more fun. I’d love to hear your suggestions in the comments below!! This behavior falls in the realm of trick training but is still super fun to teach and then show off. To start, I usually use a ballpoint pen, hoof pick or other dull, pointed object pressed repeatedly into the mane to annoy the horse like a fly. Typically I do this about four inches up from the wither. I’ll keep annoying the horse with the object and usually, they will shake their head to try and get rid of “the fly”. Once they do I give them a nice treat and repeat. Starting with a couple of times a day. Eventually you can transition this behavior to where you just point at the horse’s neck and they’ll shake their head. That’s really fun to use to ask the horse “questions” when kids come out! Obstacles have always been my number one go to for a new horse or any horse that needs confidence. Obstacles can be a great relationship building tool. With obstacles, horses learn to trust you to guide them safely in strange situations. When first introduced, bridges can be difficult for horses. When the horse first steps on a bridge obstacle like the one below, it sounds hollow. Horses can get worried and not want to put their full weight on the bridge. When first learning, we try to allow them time to think and process without rushing them. They can take all the time they need but they have to try. These are some of our articles on obstacles which are great for groundwork! 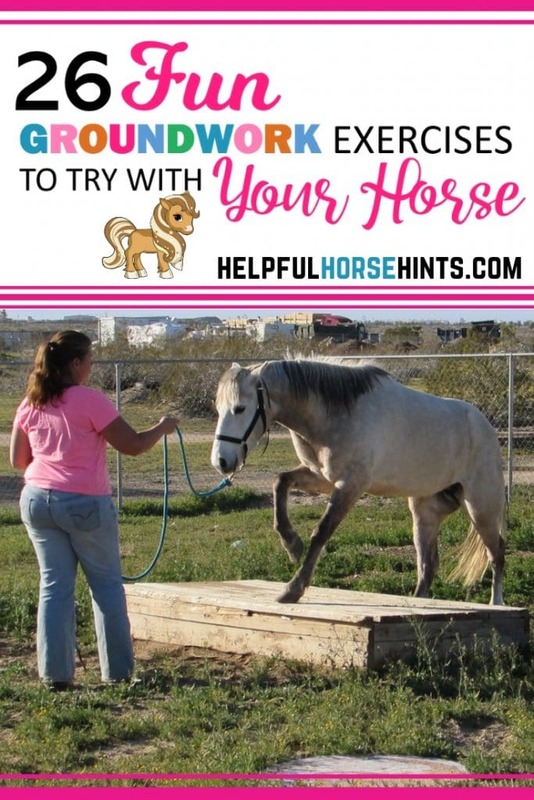 Download the remaining 20 fun horse groundwork exercises below.